No one knows better than designers, contractors and architects that light shelves are a less-than-ideal solution when you’re trying to bring more daylight into a building. 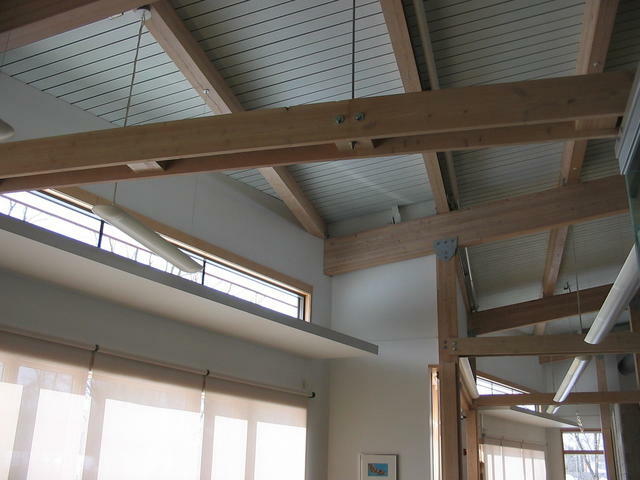 But light shelves do work and, if implemented correctly, can achieve daylighting objectives remarkably well. Light shelves redirect light onto the ceiling, driving light deeper into interior spaces and away from floor. The most effective light shelves are on southern elevations with a combination of interior and exterior light shelves, with exterior shelves blocking any direct glare and thermal gain and interior shelves driving the light deeper into the space. Often requiring precise building orientations and with the potential to add significantly to the expense of a project, light shelves don’t function particularly well on eastern and western elevations when the sun is low in the sky, especially in the winter months (in North America). But because most buildings aren’t oriented on a perfect east-west axis and aren’t perfect squares or rectangles, the use of light shelves gets more complicated. Maximizing their use on buildings that don’t fall under prime conditions requires some form of complex daylight simulation. In practice light shelves are either designed using “rules of thumb”, meaning they’re not as effective, or budgets have to include a daylight analysis. Even if budgets do allow for detailed analysis at the design stage, light shelves usually face their toughest battles at the cost review stage. Other issues relating to the use of light shelves include the misuse by occupants for other purposes than intended, like book shelves. Furthermore if they are not cleaned and maintained on a regular basis then they can become an indoor air quality hazard due to dust and dirt buildup. 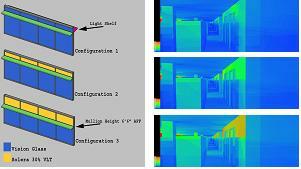 Advanced Glazings conducts daylight simulations and studies. Our results reveal that the use of Solera™ light diffusing panels achieve as good, if not better, daylight penetration than light shelves, while eliminating glare and thermal gain. Using Solera T, Solera S or Solera+Nanogel Insulation units also increases the building envelope’s thermal insulation. All this while saving cost .